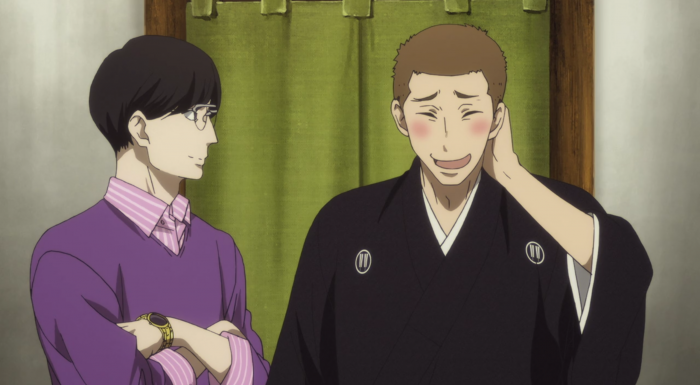 Rakugo is back-ugo, and so am I to chat about it! My pick for Best Anime of 2016 wastes no time in this Season 2 premiere reminding me why it’s so special. 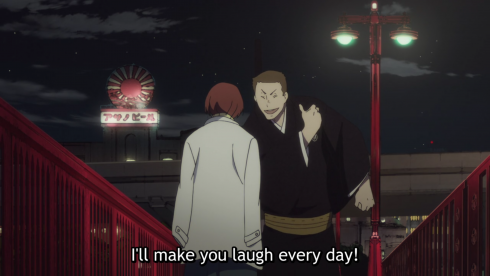 Right from its opening monologue Rakugo Shinju is a masterclass in storytelling, every element of the production accomplishing multiple tasks at once. 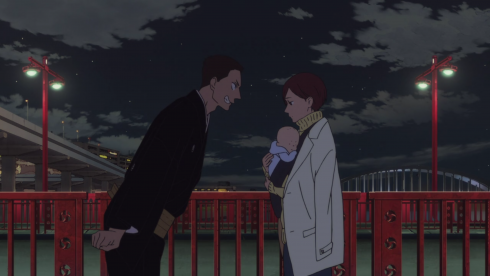 Take that brilliant Season 1 recap, which not only does the obvious job of summarizing what happened last season, but also reminds us what a rakugo performance looks like, ingratiates us to Yotaro (a character we’ve spent relatively little time with), and sets the general tone for this second season. 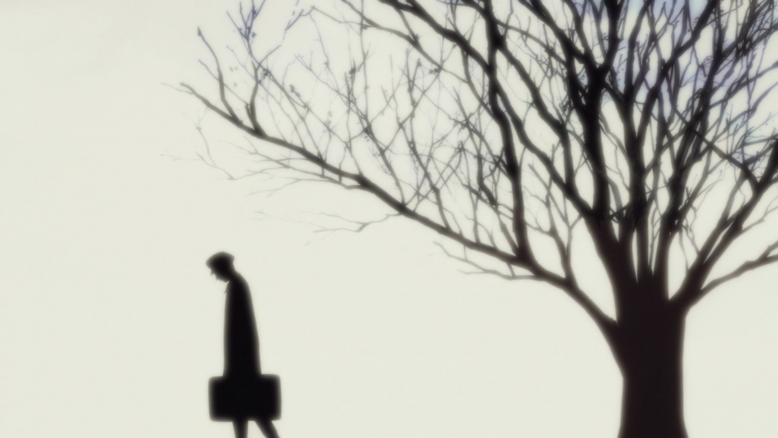 It’s exuberant and honest and warm, a stark contrast to the quiet melancholy of the first season, and promises us that following Yotaro is going to be a unique experience compared to the time we spent with Kikuhiko. That said, Season 2 doesn’t exist in a vacuum. There are a lot of ideas swirling through Rakugo Shinju, but–as our new English title, “Descending Stories,” so aptly demonstrates–if I had to pick a primary theme, then it’s one of history and inheritance: The way the past affects the present, the way the present reflects the past, the threat of stasis, and the roundabout forward progress of the world. Repetition with variation, slowly leading to something new. So while the shift in character perspective changes the overall tone, there are still echoes of last season that permeate every scene, particularly the ones with Konatsu and Yakumo, which gives even the most hopeful of moments a kind of quiet, aching sorrow (and geez, the new opening theme doesn’t pull any punches in that respect, either). But in his clumsy, energetic way, Yotaro is trying to change that. 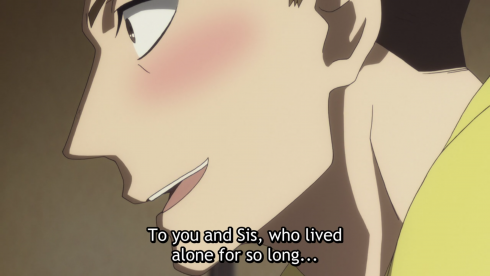 Rakugo Shinju has always been a story about strays, so it’s no surprise that Yotaro has a lot in common with the previous generation when it comes to driving motivations. Like Kikuhiko before him, Yotaro is deeply grateful to the people who took him in and gave him a chance when no one else would, and he works hard to make them happy. He wants to entertain his fans, make Yakumo proud, and do right by Konatsu. He’s as much a loyal caretaker as Kikuhiko was–and as desperate for affection as everyone in this beautiful, sad little story. The difference is that, unlike our reticent Season 1 protagonist, Yotaro wears his heart on his sleeve, straightforwardly telling everyone how he feels or what he wants as soon as he thinks it. With people as guarded and withdrawn as Yakumo and Konatsu, that’s going to rattle them–but more importantly, it’s going to encourage them to reach out, too. I think we already see that happening, especially with Konatsu’s muttered “thank you” when Yotaro earnestly expresses his love (not his pity) for her. Hopefully he’ll continue to be an emotional lighthouse of sorts, drawing both his found family members out of the dark, choppy waters and towards shore together. Yotaro needs to be careful, though, lest he focus so much on becoming what others want that he lose sight of himself (and his many strengths) altogether. 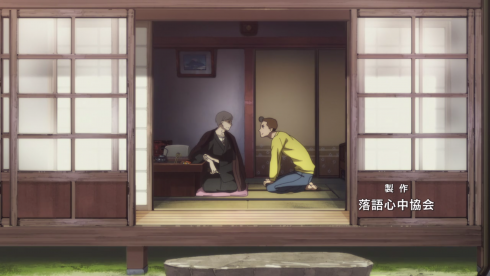 In Rakugo Shinju, character arcs are inextricably tied to the performing arts, and I think we’re seeing Yotaro at the same crossroads as rakugo itself. He wants to “adapt to fit” the Sukeroku name, but as with the dying art of rakugo, I don’t think simply mimicking the previous generation is the right answer here. As our new writer friend, Higuchi Eisuke, reminds us, artistic mediums must be “made new again” if they’re to survive through the generations, and this often means rejecting the work of the past masters. 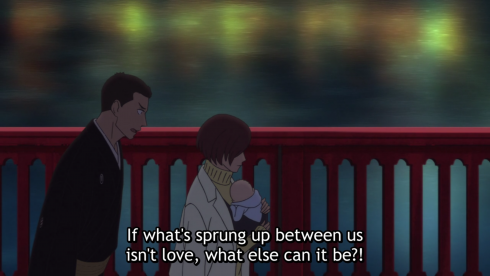 I think Yotaro will ultimately need to do the same if he’s to truly move himself, rakugo, and his family forward. Gorgeous callback to the leafless branches imagery of S1E10. This show is truly a gift. It’s pessimistic because, um, have you met Yakumo?, but it’s also somewhat revolutionary, rejecting the idea that history and famous names matter at all. 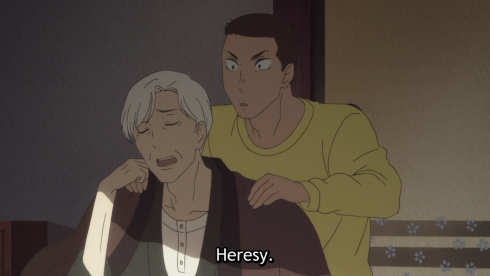 While Yakumo claims that adding new stories to the rakugo catalog is “heresy,” he also encourages the younger generation (Yotaro and Konatsu both) to make their own choices. Yakumo’s mantra is essentially “you do you,” and while that can come across as cold at times, it’s also liberating. 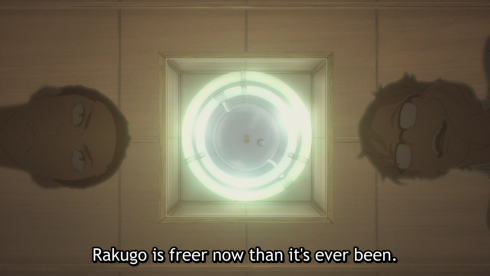 In his own way, I think he’s trying to break those same shackles that Eisuke talks about, freeing the younger generation to make rakugo their own. 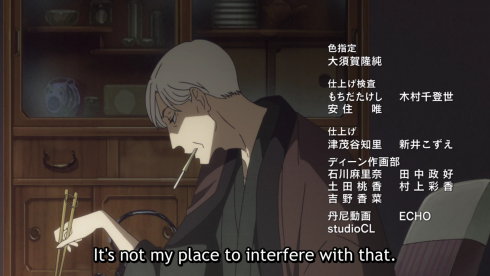 Maybe Yakumo’s “double-suicide” with rakugo isn’t about destroying the art entirely, but about severing it from the traditions and expectations that hurt him and destroyed the people he loved. In short, this was pretty much the perfect premiere, serving as a refresher course for all our characters and big ideas–the future of rakugo, the weight of tradition, the power of performances and names to affect our identities, the importance of community/family, and the tension between preservation and change–while also showing us a path forward and the potential for things to be different this time. 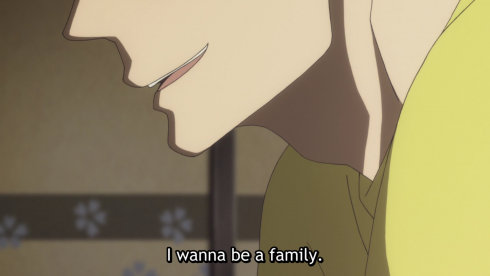 Yotaro wants to move back in, giving both Yakumo and Konatsu the family they were denied all those years ago. Yakumo talks of his “fate” and Yotaro promises to defy it. He may speak of becoming more like Sukeroku (a terrible idea, really), and he may not fully understand everything Eisuke told him, but already he’s beginning to “reject” those past masters, searching for a way forward that’s uniquely his own. Kikuhiko’s rakugo was for himself–as long as he could perform, the rest didn’t matter. Sukeroku’s was for the audience–so if they lost interest, then so would he. But Yotaro? 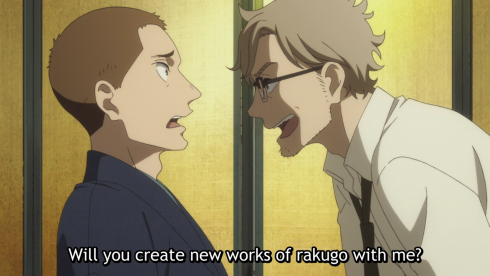 Yotaro’s rakugo is for rakugo itself, promising he’ll do whatever it takes to save the art he loves. Grim opening theme aside, that’s a mighty hopeful place to start. Apologies for the late post! I’m in the middle of a whirlwind two weeks. Episode 2’s commentary will likely be delayed as well, but after that we should get back into a Sunday publication schedule like we were with Season 1. 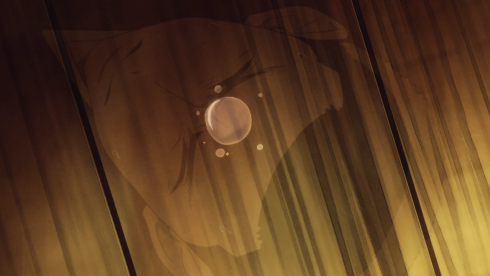 There are some pieces to this episode (like Yotaro’s friend Mangetsu) that are a little jarring, but that’s just because us poor souls in the English-speaking world don’t have access to the full-length first episode (which was initially released as an OVA–Rakugo Shinju has an interesting production history). Anyway, for some additional background, check out this helpful breakdown of the “deleted” scenes! 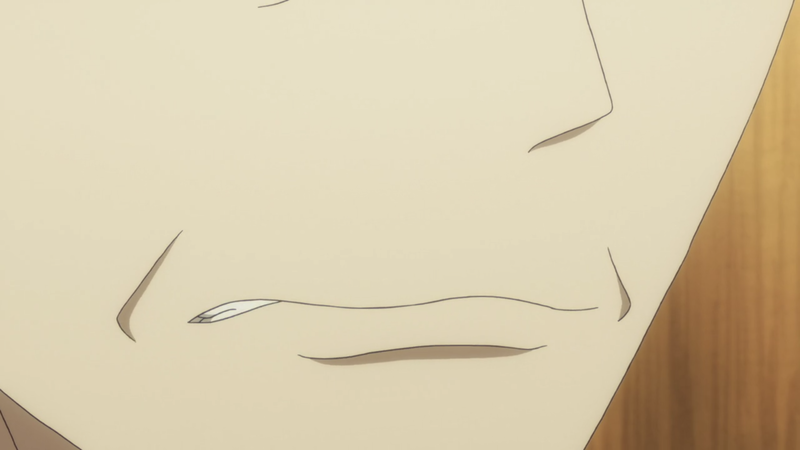 I see that in addition to inheriting Yakumo’s independence and pessimism, Konatsu has also inherited his stink-eye. He must be so proud. Okay but where’s my bonus episode where Yakumo teaches Yotaro how to dance? This is extremely important and I need it immediately. The Sensei Next Door: Mangetsu laments that people are only interested in “speed” these days and cites manzai as his example. Manzai is a rapid-fire two-person comedy routine involving a straight man (tsukkomi) and a fool (boke) that involves lots of puns and usually some slapstick. It’s evolved over the centuries and remains fairly popular today. 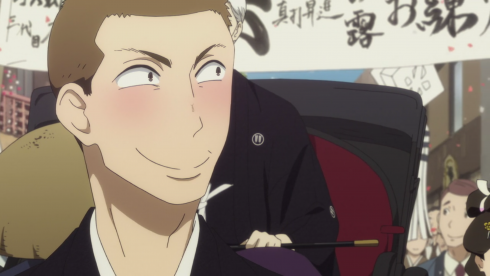 This Week in Rakugo: A woman reluctantly considers marrying an entertainer, and a young man enthusiastically shouts at the behest of the women sitting with him. Seriously, bless this show.